With December right around the corner, it won't be long before you can no longer avoid the sight of Christmas trees, glitter and lights. If you haven't had a chance to think about your tree yet, don't worry because we're got you covered. Here's a list of some of the best places to buy a tree in the Leeds and Bradford area. Every year, the folks over at Swillington Farm (0113 2869129, swillingtonorganicfarm.co.uk) chop down trees from their farm just outside Leeds, selling them freshly cut in their shop throughout December. 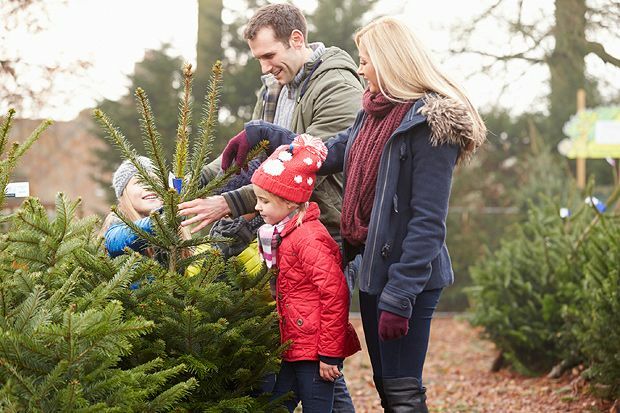 Pop along with the whole family to choose your perfect tree and since they're all unwrapped, it'll be easy to pick one. High Trees Garden Centre (0113 2587788, hightrees.co.uk) on Otley Old Road has a fantastic selection of trees to choose from, including Norway Spruces, White Pines and Noble Firs. You'll also be able to find artificial trees, decorations and lights at the centre. Just outside Leeds, the Langlands Whinmoor Garden Centre (0113 2731949, langlandsgardencentre.co.uk) sell Nordmann Firs from 4–9ft. Kids can also be kept entertained by a visit to Santa, who will be in his grotto every weekend from 11am-4pm. Rothwell Garden Centre (0113 282 2227, rothwellgardencentre.co.uk) also sell Nordmann Firs, offering a handy delivery service if you can't quite fit your chosen tree in your car. Woodend Nurseries (0113 2862 888, woodendnurseries.co.uk) in Great Preston have a variety of trees that are 4–9ft in height, as well as Christmas wreaths and table centre pieces that are available to order. The Garforth Garden Centre (0113 286 2183, klondyke.co.uk/static/garforth-garden-centre) have Fraser Firs, Norway Spruces, Nordmann Firs and pot grown trees on offer, with prices starting at £19.99. Not far from Leeds Bradford Airport, Swincar Nurseries (Guiseley, 01943 – 874614, swincarnurseries.co.uk) also have a good selection of pot grown living trees. Stockeld Park (01937 586333, stockeldpark.co.uk/christmas-tree-shop), the adventure park in Wetherby near Leeds has a number of activities for kids this Christmas including a Nordic ski woodland trail, Enchanted Forest and ice rink. While you're enjoying some festive fun, you can also choose from hundreds of Christmas trees ranging from 4–12ft. In the outskirts of Wakefield, you'll find Horticare (01924 372433, horticarewakefield.org.uk) who specialise in the production and sale of garden plants. Around the festive season, you'll be able to buy Christmas trees and holly wreaths, with help from the knowledgeable staff. Christmas Trees Leeds (07925 897 228, christmastreesleeds.co.uk) deliver Nordmann Firs to the Leeds, Bradford and Yorkshire area. Choose between a 5-6ft tree for £45 and a 6-7ft tree for £53. Stands are also available for only £7. At New Coley Nurseries (01274 834992, newcoleynurseries.co.uk) in Denholme, an indoor Christmas tree forest awaits you, where you'll be able to find anything from a 3ft tree to a 20ft tree. On the weekend of Sat 3 Dec and Sun 4 Dec, New Coley will also be hosting Santa and his reindeer, with hot refreshments available in their Christmas cabin. Selling everything from trees to lighting, ACW Garden Centre (01274 392344, acwgardencentre.com) have all the elements you need to decorate your home this Christmas. They have Nordmann Firs, Fraser Firs and traditional Norway types in a variety of sizes that are both cut and potted, depending on your preference. Nordgreen Nurseries (01274 690611, nordgreennurseries.com) in Halifax have potted Nordmann Firs and Norway Spruces that are 3–6ft in height and available throughout the year. For cut Christmas trees, pop by towards the end of November or in December and you'll be able to find 3-9ft trees. If you're after something bigger, you'll have to order in advance. In Mirfield, south of Bradford, Whiteleys Garden Centre (01924 495944, whiteleys-gc.co.uk) host a number of Christmas themed events during the festive season, including tea with Santa and an annual pantomime. Nordmann and Fraser Firs are available to buy from £14.99 and delivery can be arranged if you're unable to drive it home. A bit further out in Clitheroe, west of Bradford, Dove Syke Nursery (01200 428 417, dovesykenursery.co.uk) have trees that are either rooted in a pot or cut to size. Choose from Nordmann Firs, Fraser Firs, Scots Pines, Norway Spruces and Noble Firs that are all cut from the plantation. Some larger trees are left growing but these are limited so get in quick if you're interested. You'll also be able to find a range of wreathes on sale. Tong Garden Centre (0113 285 3506, tonggardencentre.co.uk) have Nordmann Firs, Norway Spruces and Noble Firs as well as artificial trees in various sizes. They also have a special Santa's grotto experience on offer for kids, which includes a gift with every ticket. The Range (therange.co.uk) have a number of stores all over the UK, selling everything from furniture to stationary. Visit their stores in Bradford (01274 493974) or Leeds (01132720930) to buy high quality artificial trees, including pre-lit trees and snow trees. Can you guys add Dodds Christmas Trees Leeds to your list please? Their website is www.ChristmasTreeMan.co.uk and telephone is 0113 415 2512. They deliver only premium grade trees to Leeds & surrounding areas. You can order online too!